clicky wrote: BTW quick question: is it going to be possible to read /dev/servoblaster of userspace implementation? No, because the user space implementation is not really a device driver in the usual sense of the word and /dev/servoblaster is a FIFO, not a device node. Your code writes to that FIFO, and servod reads from it, so it's not possible for your code to also read it. Thank you for the explanation! It makes perfect sense. It surely is not that bad as an idea, is it? Generally it can serve as initial value for our abstraction or to be able to slowly move servo from where it was left last time, process was killed, to new value making sure I don't jerk servo too quickly to new position - for purpose of effect or weak power supply which sometimes drops voltage if servo is driven at its maximum speed. I understand why you would want that; to provide it I'd have to rewrite a file containing the data for every servo position update; maybe that's ok, provided its on a RAM file system - I wouldn't want servod to start blocking just because the SD card was busy, for example. I'll think about it some more. Oh - no - that wouldn't be right. I am just forgetting that those are not real devices. I have followed all the steps. I have the 3.6.11+ version and the servoblaster.ko is 3.6.11 too.. but still not working. Please see the README in the github repository, and use the user space servod implementation, not the kernel space servoblaster.ko implementation. 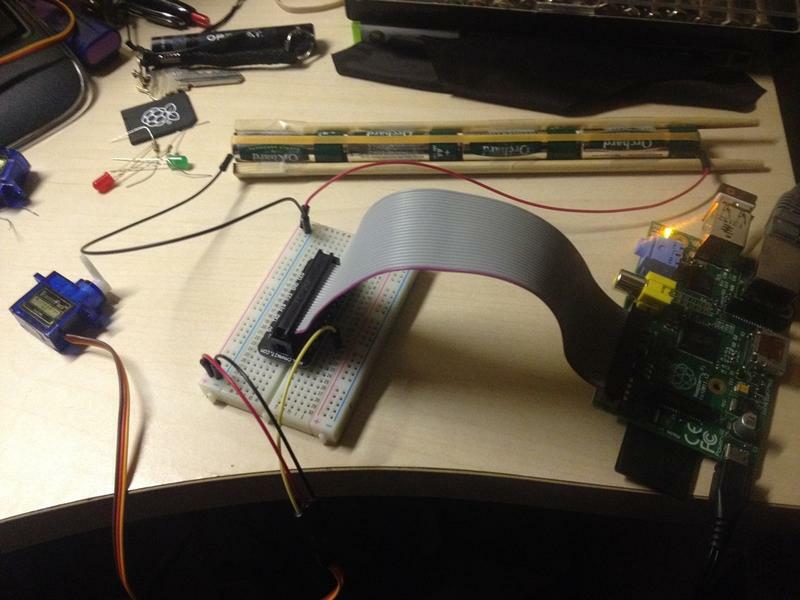 You don't have to restrict yourself to the single hardware PWM pin. The servoblaster code does everything in software, so you can control your 5 servos from 5 different GPIO pins. I suspect the include path needs changing.. I also suspect the <asm/uaccess.h> may have the same issue. The kernel version is probably deprecated. Try the userland version instead. I looked like I needed to update the kernel source .config file with a valid one, the driver now compiles. Joan is correct, the kernel space driver is depreciated and you really should use the userspace servod.c one instead (ServoBlaster/user/servod.c). You can now specify the step increment, in case 10us wasn't want you wanted. You can specify a cycle time other than 20ms, which might be useful if driving LEDs and you don't like the 50Hz flicker. You can specify pulse widths in microseconds or as a percentage, as an alternative to the original "units of 10us" scheme. You can make incremental adjustments to the position via a '+' or '-' prefix to the width you specify. Or driving fast (tail) servos! That's fantastic! I'll go and update pi4j servo driver immediately to switch to that scheme! Thanks again! But nothing happened. Did I miss anything? Did you connect some power to the servo? Did you connect a common ground line from the servo's ground to the Pi ground? My bad, I think I connected wrong GPIO cable. After changing the cable now I could do only two things: turn on and turn off the servo motor. Turn on: echo 0=0 > /dev/servoblaster and whatever value other than 0 makes the servo rotate to only one extreme and it seems that the servo tries to continue rotating . I tried 0=50, 0=100, 0=120 and they produces all the same angles. I think the angles will be different with these values, right? Those photos are either old or you haven't done what the previous poster told you to do. I didn't connect the batteries' GND with RPi's GND. Everything is fine now. Hi I'm with my raspberry pi and I can't get servoblaster to start working. I cloned the github repo and installed it. But after executing the last command I get: "ERROR: could not insert 'servoblaster': Exec format error"
and it doesn't work when I try to pass commands to it. How do I fix this error? Already tried redownloading it and rebooting my pi. Richard, You have the power (should have the power) to modify your original post to note you no longer provide 'ready built' drivers at your git repository (unless I'm mistaken - still newish to git). That way newishbies won't read 8 pages of replies to be certain such was not already covered. OTOH, reading those pages were also instructive. Just a suggestion. Thanks for servoblaster. Thanks for this awesome program! I was working on hooking up an ATTiny2313 over i2c to drive servos when I found this, completely eliminated the need for such a setup and I'm driving four servos just fine on my robot. Two are actually Vex Robotics continuous-drive motors supplied from 12V (but still tolerate a 3.3V signal line) and the other two are TowerPro SG90 micro-servos running off the Pi's 5V supply installed in a 3d-printed pan and tilt mount for the Pi camera module. It's simple to interface to servoblaster in C, at least the way I do it is just sprintf a command like "echo 1=50% > /dev/servoblaster" and then use the system() function with that string as the argument to write it out. I have my Pi-bot streaming video to my PC as well as streaming inputs from a PC gamepad from the PC to the bot which is turned into control signals to the servos. I might add more servo-driven stuff if I can figure out how to attach an arm or something. I also put 1K-ohm resistors in series with the servo control lines to protect the RPi, servos don't seem to care. 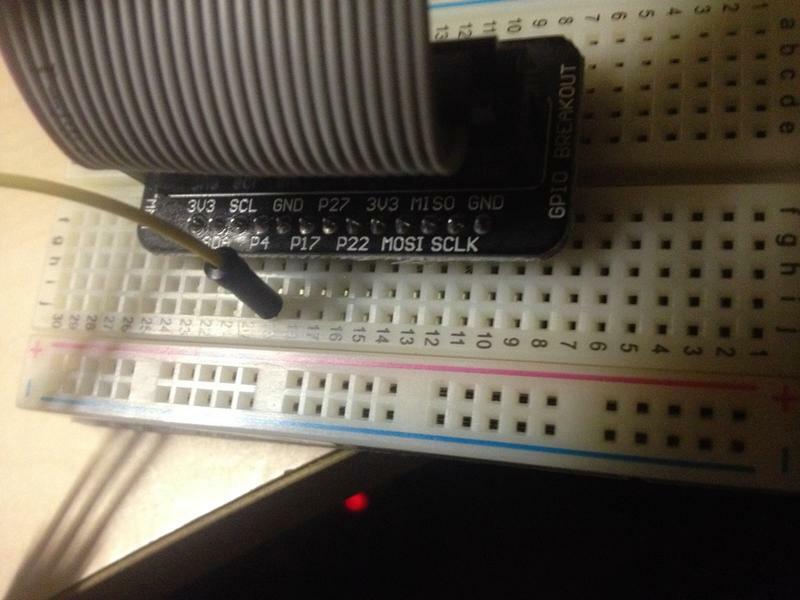 I'm using a model B+, and one of the nice features is the expanded GPIO. I know RGH hasn't uploaded any new source to the Git since the B+ came out, and a nice feature would be to get the extended GPIO mapped. Anyway, I'm just starting to look at this, so if anyone else has already completed, please do share with the world! Well after a little more digging around I found that pigpio from joan is actually already able to do all the things I wanted. I'm going to migrate my project over to pigpio, and see how that goes. where panPos was the position in percentage of the servo (e.g. 50% is centered).